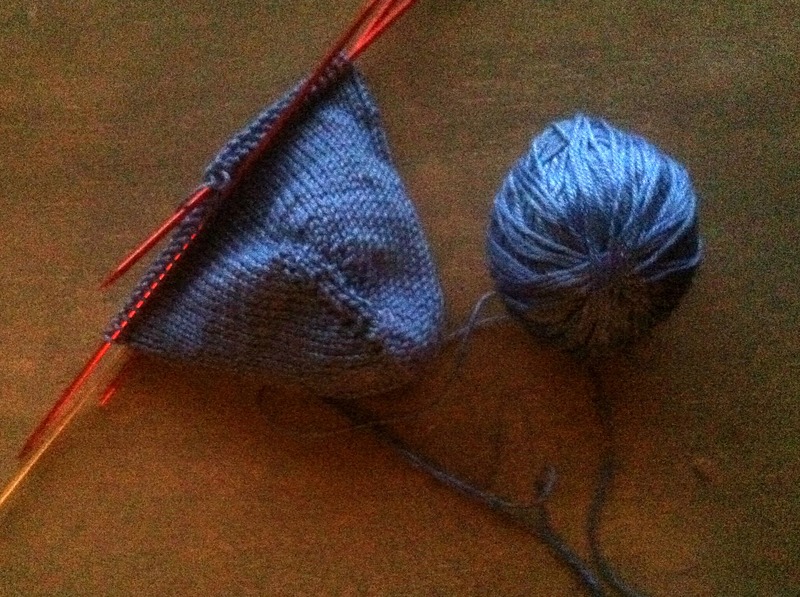 Yesterday afternoon, I decided to get started on my fourth toe-up sock attempt. That may be being a bit generous. The actual number is probably quite higher. Anyway, I brought yarn and needles to work and cast-on (twice). I think I confused my intern, who walked in as I was working my third row. No one has seen me knit at work (although I’m sure they all know I do occasionally during my lunch hour). I should note that while I don’t mind knitting in public (as public as my office can really be considered), I don’t like casting on or working the first few rounds around people. The start of the project is the most intimate for me. It’s when I feel most vulnerable about a project. I don’t know if my calculations were correct. I don’t know if my tension will be spot-on or if I’ll all of a sudden go too tight or too loose (still a bit of a newbie). It’s clumsy and uncertain. That’s why it surprised me yesterday afternoon when I decided to start at work where people could easily see me. Anyway, I was working on that during lunch and managed to get quite a bit of work done on the sock. It shouldn’t take long at all, and then I’ll work on the next one. I’m not really one to have second sock syndrome. 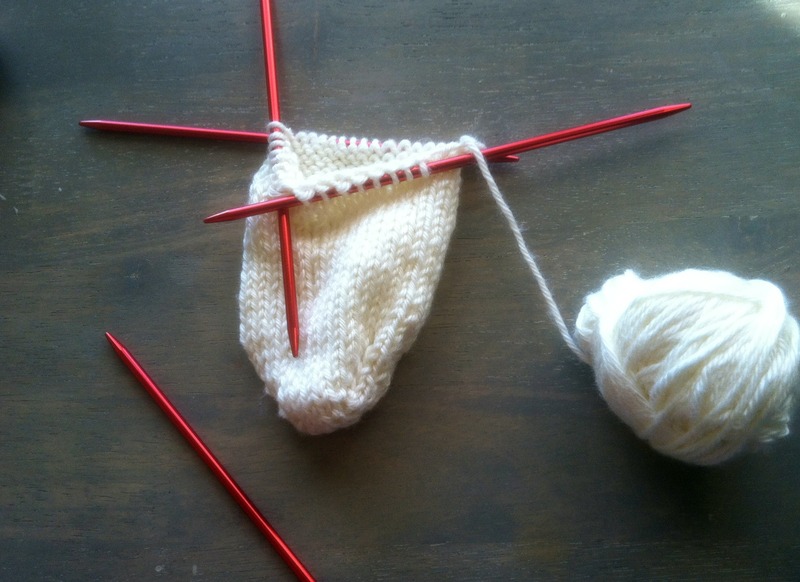 For me, the first sock is practice, even though I try to get it as right as possible. By the second sock, I’ve learned from my mistakes and usually do a better job the second time around. I also joined a Ravelry group called My First Toe-Up Socks. Around the time I first started struggling (one-two weeks ago?) with these socks, I also happened upon a discussion with some members who were going to learn how to do toe-up socks on dpns. I love dpns. (That’s a long story in and of itself.) The pattern we’re using is Sport Weight Toe-Up Socks with Gusset Heel by Wendy D. Johnson. I’m working the foot part right now, so this could take a while. Somehow, though, that doesn’t bother me. I’m enjoying it, and I was still somewhat surprised to see how quickly I got to this point. I started at maybe 7:30 pm and after a couple of Doctor Who episodes (yeah, I’m a nerd), I made it here. Ah, and the master schedule. I sat down and wrote it out last night. Saturday-Sunday: Brother’s hat and Misc. It’s not complicated, and I don’t think it ever will be. This is just for this week and next, I might add. These are the projects I’m working on right now. As I have a 52 sock goal, socks get the most attention. However, knitters cannot live by socks alone, so I’m dividing my time with other projects.